« Ragtag and Bobtails unite! Bises Rouges et Noires à Paris! 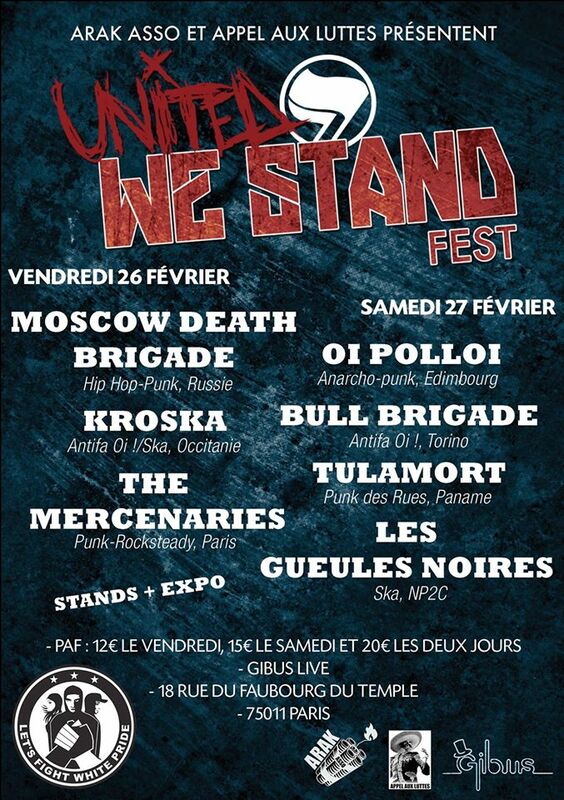 The comrades of Appel aux luttes and ARAK ASSO inviting for the United We Stand Fest in Paris next weekend. With strict antifascist bands like Oi Polloi (Official), Moscow Death Brigade, Bull Brigade, Kroska and more they wanna set a big example against the swing to the right and the state of emergency in France and point the way for solidarity and equality. Normally this is a must go for us: great attitude, great bands, great city with lots of good friends and comrades on site and the best bar ever around the corner. But because some of us are working their asses off with politics, wagework and packing orders and yet others of us are tanning their asses in the hot sun of Chile we don`t make it to Paris. While at least some of us have to spend the weekend in the cold north of Germany, you should not miss this event!